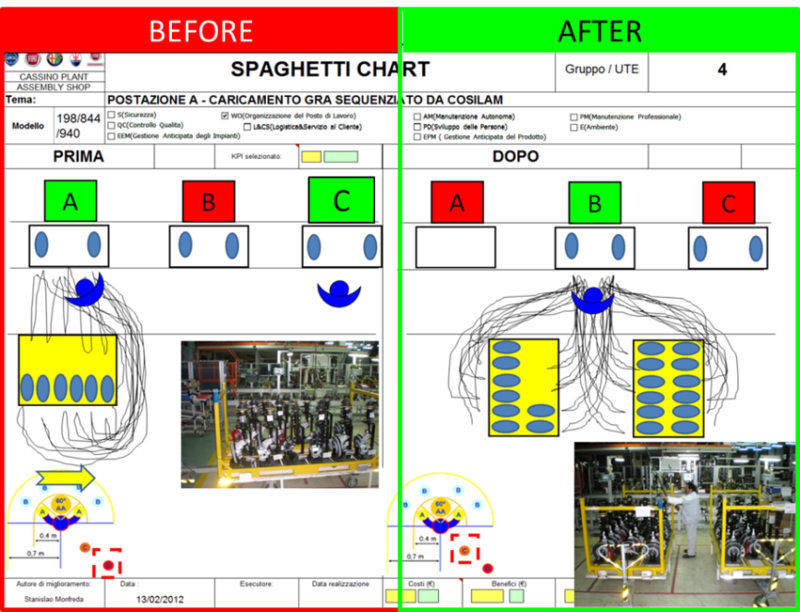 The aim of this work is to present establishments of the basic model of World Class Manufacturing (WCM) quality management for the production system at Fiat Group Automobiles in order to make products of the highest quality eliminating losses in all the factory fields an improvement of work standards. In fact, World Class Manufacturing is a manufacturing system defined by 6 International companies including Fiat Group Automobiles with the intent to raise their performances and standards to World Class level with the cooperation of leading European and Japanese experts and this includes all the plant processes including quality, maintenance, cost management and logistics etc. from a universal point of view. Thus, automotive manufacturing requires the ability to manage the product and its associated information across the entire fabricator. Systems must extend beyond their traditional role of product tracking to actively manage the product and its processing. This requires coordinating the information flow between process equipment and higher level systems, supporting both manual and automatic interfaces. A case study methodology was used to collect detailed information on division and plant strategic objectives, performance measurement systems, and performance measurement system linkages. The result of this research was to develop principles on strategic objectives, performance measurement systems and performance measurement system linkages for improved organizational coordination. 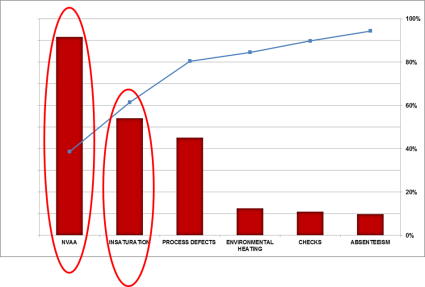 The purpose of this study is to examine the relationship between division and plant performance measurement systems designed to support the firm’s strategic objectives and to improve organizational coordination. We will focus our attention on the Cost Deployment Pillar, Autonomous Activities/Workplace Organization Pillar and Logistics/Customers Service Pillar. Fiat Group Automobiles is an automotive-focused industrial group engaged in designing, manufacturing and selling cars for the mass market under the Fiat, Lancia, Alfa Romeo, Fiat Professional and Abarth brands and luxury cars under the Ferrari and Maserati brands. It also operates in the components sector through Magneti Marelli, Teksid and Fiat Powertrain and in the production systems sector through Comau. Fiat operates in Europe, North and South America, and Asia. Its headquarters is in Turin, Italy and employs over 137,801 people1. 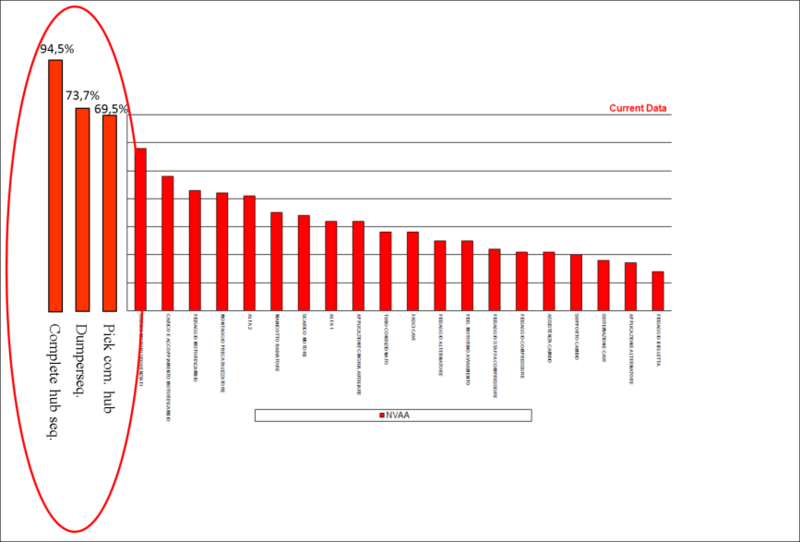 Its 2008 revenues were almost € 59 billion, 3.4% of which were invested in R&D. Fiat’s Research Center (CRF) can be appropriately defined as the “innovation engine” of the Fiat Group, as it is responsible for the applied research and technology development activities of all its controlled companies2. The group Fiat has a diversified business portfolio, which shields it against demand fluctuations in certain product categories and also enables it to benefit from opportunities available in various divisions. PLAN – Costs Analysis and Losses Analysis starting from Cost Deployment (CD) for the manufacturing process using the items and tools of Workplace Organization (WO) and for the handling process the Logistic and Customer Services (LOG) applications. DO – Analysis of the non-value-added Activities; analysis of re-balancing line and analysis of re-balancing of work activities in accordance with the analysis of the logistics flows using the material matrix and the flows matrix. Study and realization of prototypes to improve workstation ergonomics and to ensure minimum material handling; Application of countermeasures found in the production process and logistics (handling). CHECK – Analysis of results in order to verify productivity improvement, ergonomic improvement (WO) and the optimization of the internal handling (in the plant) and external logistics flows (LOG). 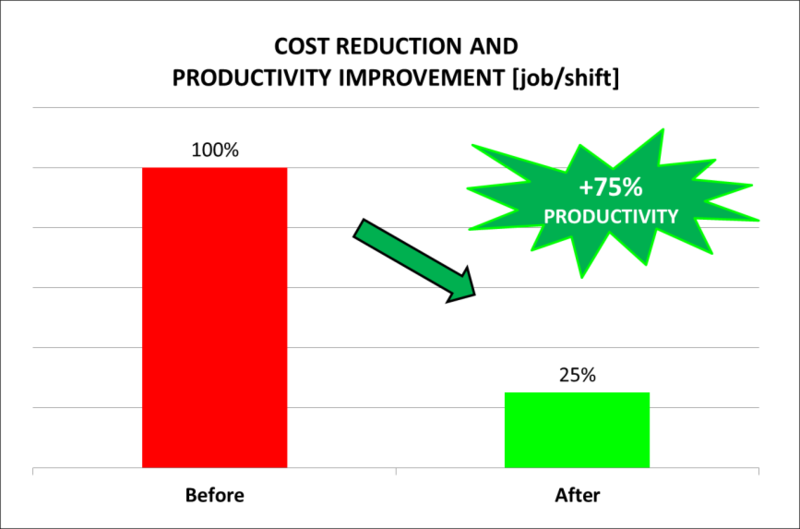 Check of the losses reduction according to Cost Deployment (CD). ACT – Extension of the methodology and other cases. 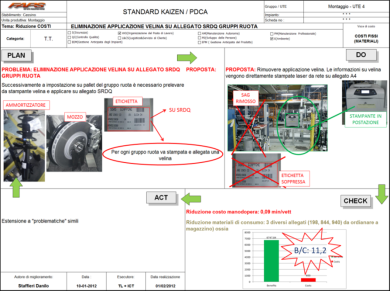 Here below is a description of the Statement of the Problem and PDCA methodology. Find relationships between waste and losses and their reductions. It is important to give a measure of all the losses identified in process examination. The data collection is therefore the “key element” for the development of activities of Cost Deployment. 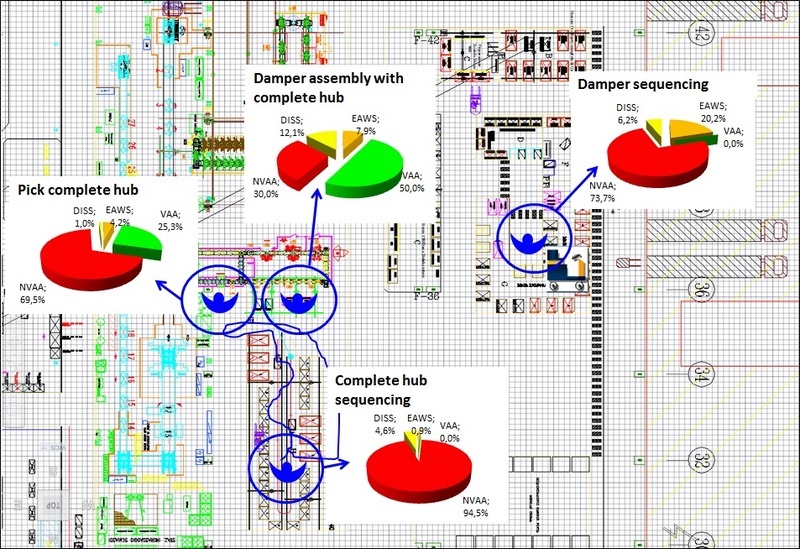 Here below in Figure 1.7 an example of losses identified from CD from the Assembly Shop is shown and in Figure 1.8 is shown an example of CD data collection regarding NVAA (Non-Value-Added Activities) for WO (for this case study we excluded check and rework losses) in the Mechanical Subgroups area. Finally Figure 1.9 shows Analysis of losses Cost Deployment. 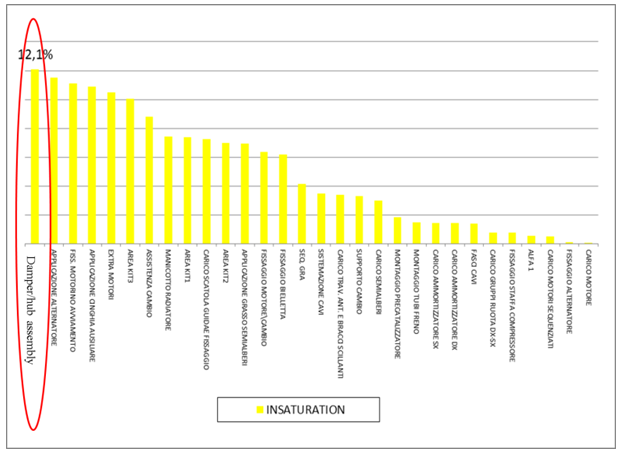 According to Figure 1.9 and Figure 1.10 were analyzed the losses regarding NVAA and Insaturation. In fact were analyzed all 4 critical workstations (because they have the worst losses) and were identified 41 types of non-value-added activities (walking, waiting, turning, picking….) in the various sub-phases of the production process. In Table 1.4 is shown some examples of non-value-added activities analyzed (MUDA Analysis). Some examples of standard tools used to analyze NVAA reduction (MUDA Analysis) for the 4 workstations are shown here below in Figure 1.10, Figure 1.11 and Figure 1.12) job stratification (VAA – Value Added Activities; NVAA – Non-Value-Added Activities; LBL – Low Balancing Level; EAWS – European Assembly Work Sheet – Ergonomy); 2) Spaghetti Chart and 3) Kaizen Standard. Figure 1.13 shows the initial scenario analyzed to identify problems and weaknesses. 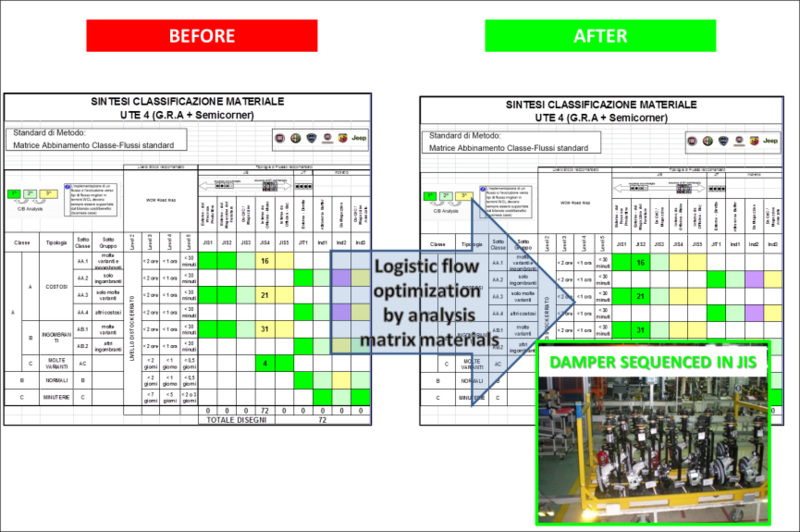 At this point was assumed the new flow of the complete damper (corner) = damper + complete hub sequencing according to the material matrix considering losses relating to handling (material matrix classification – see Figure 1.14). 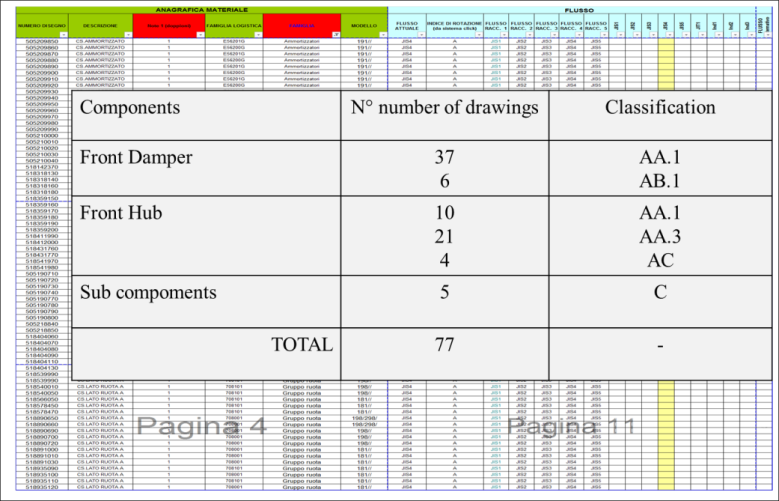 The material matrix classifies the commodities (number of drawings) in three main groups: A (bulky, multi-variations, expensive), B (normal) and C (small parts) and subgroups (a mixture of group A: bulky and multi-variations or bulky and expensive etc.). For each of these groups was filled out the flow matrix that defines the correct flow associated: JIS (and different levels), JIT (and different levels) and indirect (and different levels). 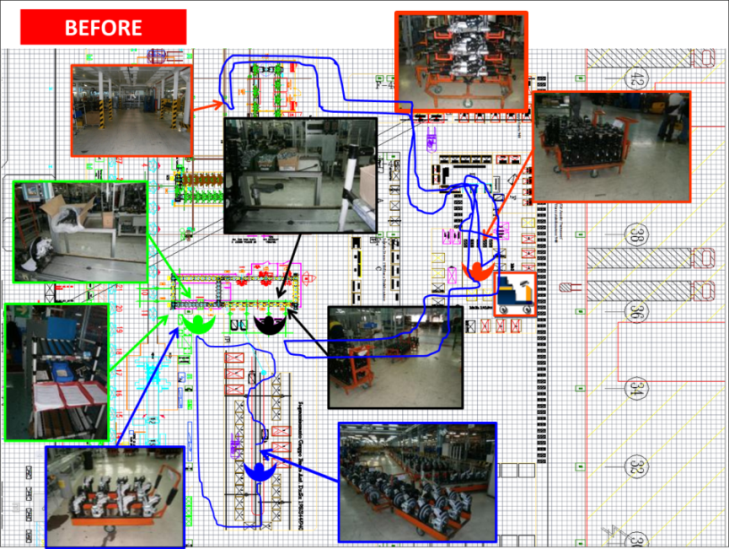 After identifying the correct flow, in the JIS case, was built a prototype of the box (bin) to feed the line that would ensure the right number of parts to optimize logistic handling. 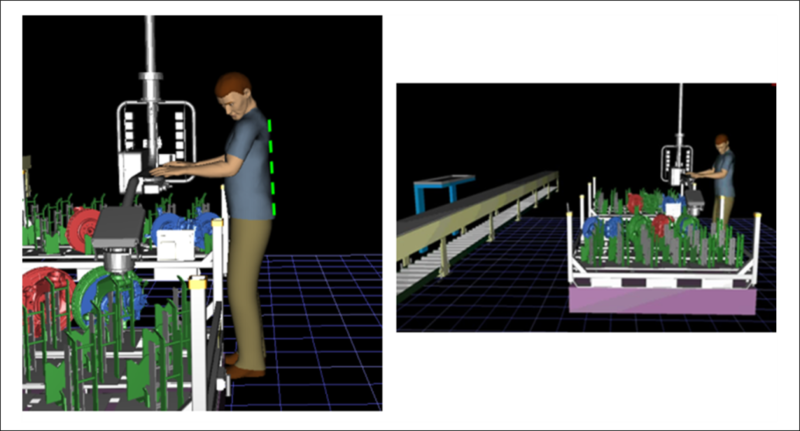 However, the new box (bin) for this new mechanical subgroup must feed the line in a comfortable and ergonomic manner for the worker in the workstation, for this reason was simulated the solution before the realization of the box (bin) (see Figure 1.15). 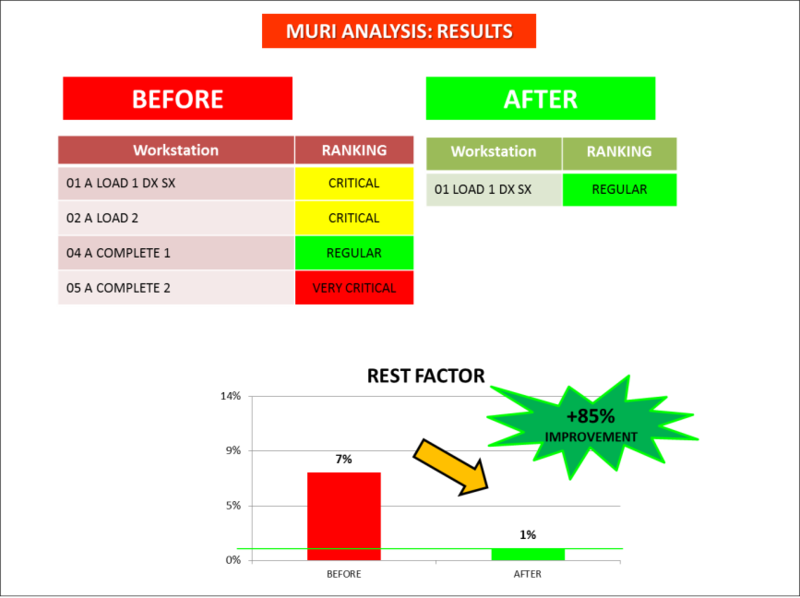 At the end of the Muda analysis (NVAA analysis) were applied all the solutions found to have a lean process (the internal target is to achieve 25% of average NVAA losses) and was reorganized the line through a new line balancing level (rebalancing) to achieve 5% of the average line balancing losses (internal target). 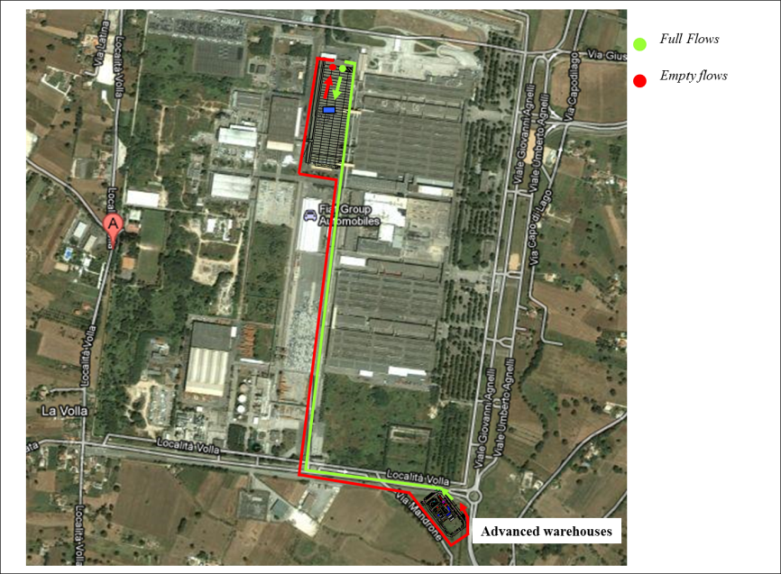 Another important aspect was the logistics flows analysis (see Figure 1.16) considering advanced warehouses ( Figure 1.17). The simulation scenario was defined using trucks from the Cassino plant warehouses that also feed other commodities to achieve high levels of saturation to minimize handling losses. 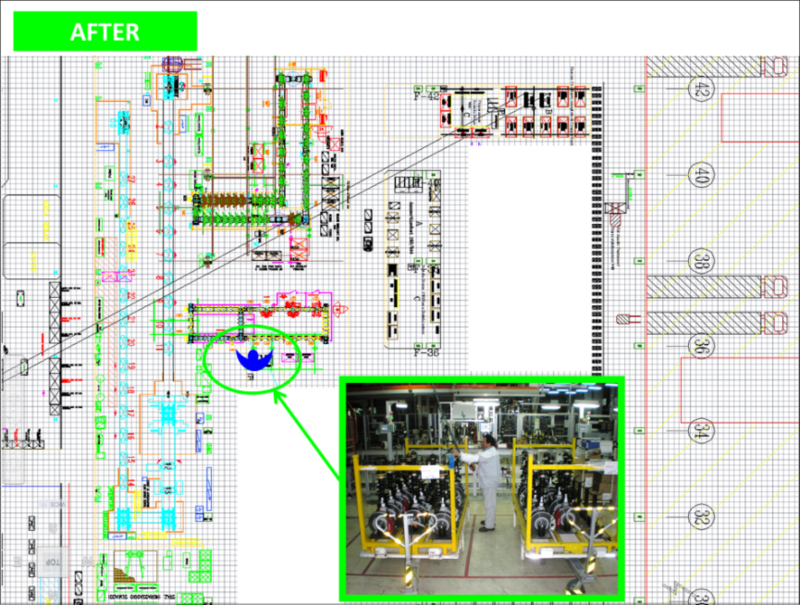 At the end of the handling analysis (flow, stock level…) thanks to this new “lean” organization of material matrix was used the correct line feed from the Just In Sequence warehouse. It was reduced the internal warehouse (stock level), the space used for sequencing (square metres), the indirect manpower used to feed the sequencing area and we obtained zero forklifts on the shopfloor because we used the ro-ro (roll in – roll out) system. Figure 1.18 shows the final scenario in which we have 1 operator instead of 4 operators. Optimization of logistic flows ( Figure 1.21) according to the flow matrix. 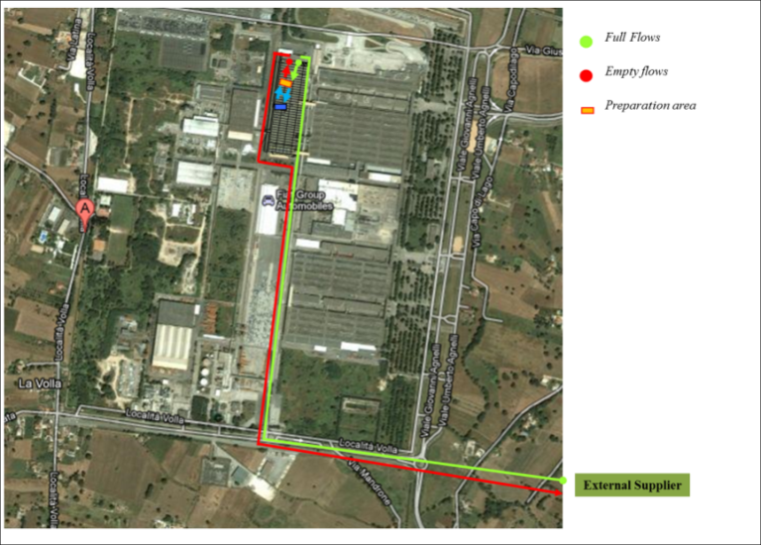 Future developments include the extension of the methodology to the entire plant. Here below in Table 1.5 we can see the activities and status adopted. to achieve the results shown in the “check”. We used traditional tools and methodology for the analysis and new tools to simulate the sceneries on the line and for the logistic problems we involved other resources outside the plant (ELASIS and CRF – FIAT Research Center, Fiat Central Department and Public Universities).